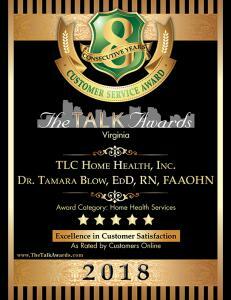 Virginia-based TLC Home Health, Inc. receives high marks for customer satisfaction, earning it eight straight Talk Awards. HOPEWELL, VIRGINIA, UNITED STATES, October 17, 2018 /EINPresswire.com/ — Receiving the highest possible customer satisfaction rating of 5 stars for eight straight years has earned TLC Home Health, Inc. eight prestigious Talk Awards. Winners of the Talk Awards are based on The Stirling Center for Excellence’s independent, proprietary research and evaluation system, which identifies businesses with a track record of excellent customer service and satisfaction. The rating system combines data collected from nominations, online and other customer reviews, surveys, blogs, social networks, business-rating services, and other honors and accolades — all of which express the voice of the customer. Only those with a 4- or 5-star rating receive The Talk Award. The mission of TLC Home Health, Inc. is to provide “tender loving care with a professional touch, all at an affordable cost,” says President and CEO Tamara Y. Blow, EdD, RN, COHN-S/CM, CBM, PLNC, FAAOHN, who established the agency after her experience serving as the primary caregiver to her mother-in-law, who had Alzheimer’s. With eight Talk Awards for customer satisfaction to its credit, the agency is doing something right. “This mission is accomplished by treating employees and clients like family,” says Dr. Blow, and is one of the main factors that has contributed to winning these consecutive awards. Providing high-level, quality care is the direct result of the agency’s values, which include operating with integrity and respect and having the courage to do what’s right. “We strive to operate with quality and excellence in all that we do,” says Dr. Blow. Other factors responsible for the consistently high customer satisfaction ratings include communication, responsiveness and hiring the right caregivers. “We solicit monthly customer service feedback to ensure the client is pleased with our services, and our RN staff performs regular house visits to make sure the caregiver is performing according to the client’s expectations,” she says. TLC Home Health, Inc. was founded in 2003 to assist families in the greater Richmond/Tri-City area with caring for their loved ones. The organization provides personal care services to seniors and disabled non-seniors within the community, including bathing, dressing, eating, feeding, toileting, laundry, assisting with medications, light housekeeping, shopping, and transportation services. TLC specializes in the care of clients with mental disabilities such as autism, Alzheimer’s and mental retardation. TLC Home Health, Inc. is located at 317 West Broadway Avenue in Hopewell, and also has a satellite office in Richmond. For more information, call 804-458-1852 or go online to www.tlchomehealthinc.com. Visit the company’s Award Page at https://www.thetalkawards.com/award/tlc-home-health-inc.
Next Next post: Is Hair Cloning the future of Hair Restoration?